Military Foams.Phase Change Materials and more…. A leader in polyurethane foam solutions, Bergad Specialty Foams is a company built on creativity and innovation. Whether you are a manufacturer, a health care professional, a member of the military, or even an aerospace engineer, Bergad Specialty Foams is making your world better. As problem solvers, we specialize in meeting the challenges unique to your business or organization. We invite you to learn more about our capabilities in flexible foams and the types of technical challenges we’ve successfully overcome. At Bergad Specialty Foams, our laboratory, manufacturing, fabrication, tooling, warehousing, and sales divisions are all located in facilities at 11858, PA Route 85, Kittanning, just northeast of Pittsburgh, PA. Since opening operations in 1999, our mission has been to “exceed, not meet,” the standards of our industry and the expectations of our clients. We believe our ever evolving foam product line is proof of our success. To learn more, call us at 724-763-2883, or visit our Contact Us page today. We look forward to serving your flexible polyurethane foam needs. Foam Problems? We can fix them! 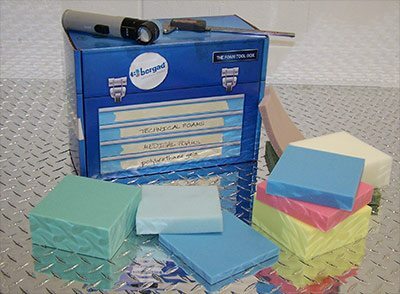 Request your sample Foam Toolbox today. After learning about your application, we’ll fill your Foam Toolbox with samples of materials specific to your needs. To learn more, call us at 724-763-2883, or visit our Contact Us page today.